No bake Nanaimo bars are a classic Canadian treat with a crunchy base, vanilla filling, and chocolate topping. They're popular with kids and adults alike! Nanaimo bars are a Canadian treat that are really popular in our house. Something amazing happens when chocolate, coconut, butter, and vanilla are made into one attractive and memorable dessert! These made-from-scratch Nanaimo bars have a scrumptious chocolate and coconut base, sweet and creamy vanilla filling, and crunchy chocolate topping. You’ll definitely want a second piece! My grandparents often make these bars at Christmastime, but they’re enjoyed throughout the year in Canada. In fact, they’re so popular in Canada that they can be bought from grocery stores! For those who are new to Nanaimo bars, these bars are quite rich from all the butter, sugar, and chocolate, so make sure to cut them in small pieces–about 32 for a 9×9-inch pan. Keep leftovers in the fridge so they don’t melt. Traditionally, the vanilla filling includes 2 tablespoons of vanilla custard powder, but I omitted this for a more homemade filling. If you’d like to use custard powder, just omit the cornstarch and decrease the vanilla extract in the filling to 1 teaspoon. No bake Nanaimo bars are a classic Canadian treat with a crunchy base, vanilla filling, and chocolate topping. They’re popular with kids and adults alike! Very lightly grease an 8×8 inch or 9×9 inch pan with butter and line with parchment paper. In a medium bowl, combine the graham cracker crumbs, coconut, and walnuts until well blended. Set aside. Place the butter, sugar, cocoa powder, vanilla extract, and beaten egg into a bowl and set over a saucepan of simmering water. Stir the mixture constantly until the butter has completely melted and the mixture has thickened. Immediately remove from the heat. Pour the chocolate mixture into the bowl of cracker crumbs and stir thoroughly to combine. Pack the mixture into the prepared pan. Refrigerate for about 30 minutes, or overnight if desired. In the bowl of a stand mixer, beat the softened butter until broken up, then add the icing sugar and cornstarch. Mix on low speed until somewhat blended, then beat on medium to medium-high speed until fluffy, scraping down the sides once or twice. Pour in the vanilla extract and add just enough sweetened condensed milk to make the icing a stiff but spreadable consistency. Spread the icing evenly over the chilled base, then refrigerate for 15 minutes or overnight if desired. Place the semisweet chocolate and butter in a bowl and set over a pan of simmering water. Stir constantly just until the chocolate and butter have fully melted. Let the chocolate cool for 3-5 minutes, stirring frequently, then spread the chocolate evenly over the chilled base and filling. Refrigerate until the chocolate has fully set, about 30-45 minutes. Once the chocolate topping has fully set, lift the bars from the pan with the parchment paper. Slice into about 32 pieces with a sharp knife. Serve chilled. Substitute the sweetened condensed milk with heavy whipping cream. 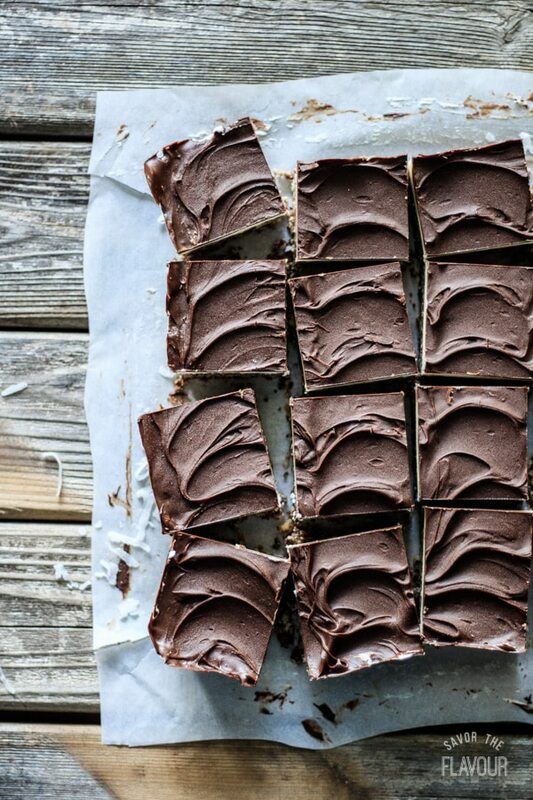 Be sure to slice the bars into small pieces because they are so rich. Store leftover bars in the fridge or freezer. Keeping them on the counter will make them quite soft.